Mimicking this idea, I’ve created a remarkably convoluted and studiously hazy formula to produce game ratings; it is called “Tingle Factor”, or TF. The higher the TF, the better. I am excluding the game between The Citadel and Wofford this week, because that matchup dominates the rest of the slate to such an extent that it is unfair to compare it to other contests. Outside of that matchup, here are the top 15 games for Week 7. All fifteen games will take place on Saturday. – The Oklahoma-Texas game will be played in Dallas, at the Texas State Fair, where fans have the opportunity to gorge themselves on such food items as tamale donuts and funnel cake queso bacon burgers. – CBS/CBS Sports Network games will also be streamed on CBS Sports Digital, as will the Villanova-James Madison game on MASN2. – The UCLA-Arizona game will be streamed on the Pac-12 Digital network. – The three highest-rated “TF” games on the board this week are also projected by sources to be the highest-scoring games among the top 15. Navy-Memphis has an over/under of 70.5, slightly lower than UCLA-Arizona (over/under of 74.5) and Texas Tech-West Virginia (72.5). – San Diego State had the largest advantage in field position in any matchup played last week (+18.8, in its game versus UNLV). – ESPN’s College GameDay is in Harrisonburg, Virginia this week for the Villanova-James Madison game, a matchup which also landed in the TF top 15 (the only FCS game to do so). It is the second time JMU has hosted the show; Lee Corso and company were last in town in 2015. The Dukes hope to avoid what happened on the field that afternoon, when Richmond spoiled the party with a 59-49 victory. – Bridger’s Battle, a/k/a the Wyoming-Utah State game, is the first TF top 15 matchup to be exclusively streamed on Facebook. 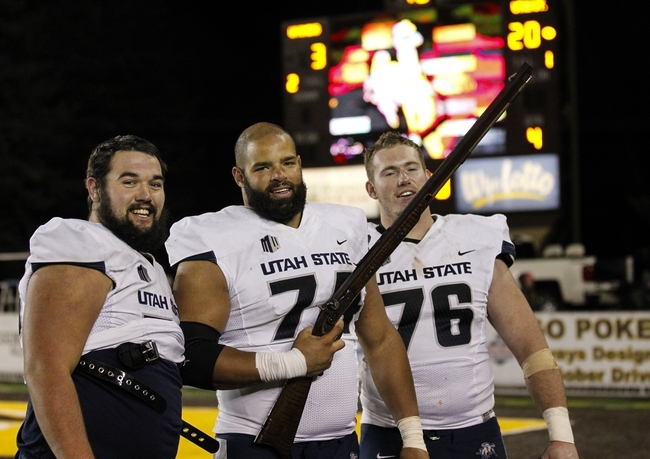 The rivalry trophy is a .50 caliber Rocky Mountain Hawken rifle. – Streaky: Central Michigan has lost seven straight games to Toledo, a streak dating back to 2010. The Chippewas had won the five games between the two teams prior to that run; however, the Rockets had won 10 straight in the series before that stretch. – The last time TCU played Kansas State in Manhattan (2015), the Horned Frogs (ranked #2 at the time) escaped with a 52-45 victory after trailing 35-17 at halftime. – Miami has never lost to Georgia Tech in the facility known as Hard Rock Stadium (which was previously Joe Robbie Stadium, Pro Player Park, Pro Player Stadium, Dolphins Stadium, Dolphin Stadium, Land Shark Stadium, and Sun Life Stadium). The Hurricanes are 4-0 against the Yellow Jackets there, regardless of the name. – In the last five seasons, the Texas Tech-West Virginia game has averaged a total of 64 points per contest. WVU has won the last three games in the series. – South Carolina has played five overtime games in its history, going 2-3 in those contests. All three of the losses were to Tennessee (and all by three points). – The contest between Texas A&M and Florida will be only the fourth meeting in the series, and only the second since 1977. The Gators have won two of the previous three matchups. – It is a shame the Auburn-LSU game is not being played at night. That probably lessens the chance for a repeat of the 1988 “Earthquake Game“. Yes, this is well after the fact. On the other hand, The Citadel’s 23-22 victory over South Carolina on November 21, 2015 won’t be forgotten by Bulldog fans anytime soon (or by supporters of the Gamecocks, for that matter). The idea for this post occurred to me recently when I saw a stray tweet from the day of the game (it was an old re-tweet). I then realized that I had never really paid a lot of attention to the in-the-moment reaction on Twitter to the events unfolding at Williams-Brice Stadium, mainly because I was at the game. Months later, I took a look back. It was something to behold. I decided to “curate” a list of tweets related to the game, just for those (like me) largely unaware of what was happening on Twitter. It is by no means a complete list; for one thing, there were plenty of interesting tweets that were a bit too profane for me to include in this set. I also decided to mostly skip over tweets that referenced things the majority of fans of The Citadel know all about, like Mike Houston’s postgame interview with Paul Finebaum (and the subsequent presser with the rest of the media). For a more thorough overview, the “links of interest” section in my game review might be worthwhile for some readers. What follows are tweets from media members, fans, former players (on both sides), and a few other observers. The tweets start from around 2:53 pm ET on that Saturday, the moment Tyler Renew scored the go-ahead touchdown for The Citadel in the fourth quarter. The series concludes almost eight hours later. Note: it takes a few seconds for all the twitter links to download. Patience is a virtue. 3rd & 1 turns into a 56yd td run for Citadel. CITADEL SCORES! 56-yard run with 6:07 to play. 23-22 over South Carolina, 2-point play coming up. Get to SEC Network Alternate, "The Ocho"
Citadel lines up to go for 2, and the Mic Man yells, "Block that kick!" Tyler Renew busts up the middle for a 56-yard touchdown. Citadel 2pc is stopped, but Bulldogs lead 23-22 with 6:07 left. Great. Just great. We are losing to Citadel with 6 minutes left in the game. We have jumped the shark. The Citadel just scored a TD and lead South Carolina 23-22 6:07 to go. The Citadel could be one stop away from winning this game. Let that sink in your head for a minute. DID YOU KNOW A CITADEL PLAYER SOLD PEANUTS AT WILLIAMS-BRICE? DID YOU KNOW PERRY ORTH WORKED AT PUBLIX? Overheard by cheerleader: "if we lose to the Citadel I am QUITTING." Citadel just stuffed South Carolina on 4th down. Could The Citadel win the ACC? The Citadel is stuffing South Carolina. Just stuffing them. 4:07 left in the game. Carolina turns it over on downs at Citadel's 46-yard line. Everything is going dark. Citadel ready to party like it's 1990 after stopping #Gamecocks on 4th down. Man I love South Carolina football more than anything. But this is borderline unwatchable. This is THE CITADEL at home. A little Humble Pie for the SEC Forgettable Scheduling. The Citadel up on South Carolina, and FAU tied late. Maybe open dates are better. See several Clemson fans at Death Valley with phones out watching the end of South Carolina-The Citadel. When you lose to Citadel at home, Joe Kines magically appears to coach your team for the next year. If South Carolina loses to the Citadel I will proudly burn my carolina clothes and become a Bama fan…. My dad went to the Citadel and unfortunately recently learned how to send text messages. If The Citadel holds on, UNC will edit the game film and change Citadel's jerseys to theirs. The crowd shot of The Citadel fans after that was AMAZING. Saw some bros laughing and saying bring it back. The Citadel is going to beat South Carolina. Um, wow. We win. The Citadel has beaten South Carolina!!!!!! South Carolina just lost to the Citadel 23-22 in Columbia. South Carolina plays No. 1 Clemson next weekend. The Citadel beats South Carolina. Wow. What an upset. Even as bad as South Carolina is. Spurrier knew when to get out, I guess. That'll just about wrap it up. The Citadel takes a knee and this one is over. Bulldogs win 23-22. Why is there not a brewery near The Citadel that makes a beer called "The Citad-ale"? The Gamecocks lose to an FCS opponent for the first time since 1990. Then it was … The Citadel. The Citadel pulls off an SEC upset! South Carolina loses to The Citadel. The Citadel beats South Carolina. Spurrier quit at the right time so this wasn't on his record. He still gets to own a share of it. The Citadel beats South Carolina. First win against an FBS team since they beat Army 15-14 in 1992. President Frank Underwood graduated from the Citadel, I don't know why y'all are so surprised. First upset of the day. South Carolina (3-8) goes down to The Citadel. The sun will shine again, SEC East. Maybe. Citadel beat South Carolina. There is no such thing as a cupcake game for the Gamecocks. Maybe South Carolina is the cupcake game. Thinking The Citadel should get a crack at Clemson for the state championship next week rather than South Carolina. Citadel has a transitive victory over North Carolina. We just lost to The Citadel… It helps to say it out loud. Never mind. It doesn't help at all. I say bring the Citadel in the league. A ton more SEC than Mizzou. Seriously, when are the #B1G and the Big 12 going to have the guts to play The Citadel and Florida Atlantic in Week 12? South Carolina nearly pulls off the upset but Citadel is able to hold on. So…… We lost to the Citadel ? What happened ? What happened …. Couldn't watch the game, citadel though? The Citadel 23-South Carolina 22! So I guess this means that Citadel is the best team in the ACC Coastal. They just announced that The Citadel beat South Carolina and it got loud at Death Valley … with laughter. The Citadel received a $275,000 check for this game. DUE TO THE GAMECOCKS LOSS TO THE CITADEL…ALL USC FOOTBALL PLAYERS DO NOT GO TO ANY BAR TONIGHT IN 5 POINTS OR THE VISTA…DOWNTOWN PERIOD! We paid the Citadel $275,000 to beat us. Awesome. The Citadel is still trending almost 2 hours after the game ended. Can't buy the state, regional and national exposure Bulldogs are getting. The Citadel won? @SandlapperSpike, are you dead? USC player said they couldn't match citadel's speed. That should make u angry. No one has run for more against South Carolina than Tyler Renew's 174 for Citadel. Georgia's Chubb had 159; LSU's Fournette had 158. Listened to 4Q of South Carolina – Citadel football on drive up. Todd Ellis and Co. were sad, disgusted and sometimes funny. Every Clemson alum in Charleston should be buying a Citadel cadet a beer tonight. @woodywhitehurst My neighbor just graduated for the Citadel, I bought him a whole damn case. I just heard the Citadel beat the #gamecocks in football. Yet people have trouble believing in ME. – Did you know Tyler Renew once sold peanuts at Williams-Brice Stadium? And he is short! Short of the first down! And The Citadel Bulldogs are going to win the football game! – For you triple option groupies (and you know who you are), the game-winning touchdown run by Tyler Renew came after an audible by Dominique Allen. According to Allen, the original play call was for an inside veer, but when the Gamecocks “bumped down to a bear front”, he switched to an outside veer. – Don’t let some upset Gamecock fan try to tell you they got “cheated by the refs” on the non-play at the end of the game. Well, a few fans may whine anyway, but they should get no sympathy. On replay, the whistle can clearly be heard before Pharoh Cooper even catches the pass from Perry Orth, and multiple individuals on both teams had stopped playing by that point. The call was also correct, as the South Carolina slot receiver on the right side of the formation was obviously not set before the snap. You could also make an argument that at least two other Gamecocks didn’t get set before the center snapped the ball to Orth. – Apparently the SEC Network has realllllllllly long commercial breaks. The game took 3:19, despite the fact The Citadel only threw three passes. – Per South Carolina’s post-game notes, the Gamecocks had won 22 straight non-conference home games before losing to The Citadel on Saturday. Of course, those notes also mistakenly state that South Carolina has “wins in seven-straight contests” against the Bulldogs. In actuality, The Citadel has won two of the last three matchups. – The Citadel rushed for more yards against South Carolina (350) than it had averaged per game prior to facing the Gamecocks (343.7). – In 1990, The Citadel had 396 total yards in a victory over the Gamecocks. In 2015, The Citadel had 387 total yards in a victory over the Gamecocks. And in 1950, The Citadel had…118 total yards in a victory over the Gamecocks. Of course, the Bulldogs blocked two punts for TDs in that one. Special teams, baby. The Citadel only committed one turnover in those three games — combined. That came in the third quarter of the 1990 game, when the Bulldogs lost a fumble. South Carolina fumbled it right back to The Citadel two plays later. – The Citadel now has four victories in its history over SEC opponents. The previous three came in 1962 (against Vanderbilt), 1979 (Vanderbilt again), and 1992 (Arkansas). – “Tyler Renew used to sell peanuts at Williams-Brice Stadium” is this year’s “Jerome Bettis is from Detroit”, as far as storylines involving The Citadel are concerned. – Your guess is as good as mine as to what South Carolina hoped to accomplish on that two-point conversion lateral to offensive lineman Brandon Shell. Shy Phillips did a good job making the tackle, which was akin to chopping down a giant redwood. – The Citadel’s defense held the Gamecocks to 2.9 yards per carry, a major factor in the Bulldogs’ victory. Tevin Floyd and James Riley tied for the team lead in tackles on the day, with seven each. All seven of Riley’s tackles were recorded as solo stops. The last of those came on a 4th-and-10, with Riley tackling Brandon Wilds two yards short of the first down the Gamecocks had to have. – Will Vanvick had a fine day punting, saving his best effort for last, a 36-yarder downed on the Gamecocks 3-yard line late in the game. Aron Spann also should be credited with making a nice play to down the ball. – Eric Goins also had a memorable afternoon, with a career-long field goal of 48 yards and a tackle on one of his kickoffs. That may have been a touchdown-saving stop, too. I held my breath on The Citadel’s kickoffs, as several times it appeared South Carolina was very close to breaking a long gainer. The Bulldogs need to work on that this week as they get ready for the playoffs. I watched the selection show. It wasn’t one of ESPN’s smoothest efforts; it included a reference to “College of Charleston Southern” and another announcer confusing Western Illinois with Western Carolina. However, the actual bracket was even rougher. I think the selection committee did a poor job. I’m glad The Citadel is in the tournament, obviously, but I am disappointed in the regionalization of what is supposed to be a national tournament. I don’t necessarily expect teams to be sent across the country on a regular basis, but the committee overdosed on rematches this season. It is a disservice to The Citadel, Coastal Carolina, and Charleston Southern to play a three-team mini-tourney right off the bat, with those teams already playing each other during the regular season. The committee set up multiple potential second-round rematches besides that one, including possible meetings between Richmond and William & Mary, Chattanooga and Jacksonville State, Western Illinois and Illinois State, and Montana and North Dakota State. Would it have been so terrible to flip The Citadel and Duquesne, with the Bulldogs playing the Tribe and the Chanticleers hosting the Dukes? Or to switch CCU and Chattanooga in the bracket? Why does Colgate and New Hampshire have to play each other in the first round, after playing earlier in the season? That isn’t supposed to happen, and it really shouldn’t happen. I was also puzzled by the inclusion of 6-5 Western Illinois in the field (one of those five losses came to Coastal Carolina, by the way). Not only is WIU in the playoffs, it will play non-scholarship Dayton in the first round — a draw that would have been desired by almost every other team playing in the tournament’s first round. A cynic might suggest Western Illinois is in the tournament instead of North Dakota or Towson because it is close enough to Dayton that the team can be bused to the game, rather than having to fly (and costing the NCAA more money). It also appears the committee wanted to avoid having a final featuring teams from one conference (as was the case last year). That can be the only reason all five MVFC teams are on the same side of the bracket. At any rate, The Citadel has a game on Saturday in Conway. Making sure the team is mentally and emotionally prepared for that contest after beating the Gamecocks is going to be a challenge for the coaching staff. It’s a problem, albeit a nice problem to have. It better not be a problem for the fan base. I know people have made plans in advance for Thanksgiving weekend, but playoff bids don’t come along for The Citadel every year, and this team certainly deserves all the support it can get. There needs to be plenty of light blue in Brooks Stadium when the Bulldogs take the field. Get your tickets early, though. Brooks Stadium currently has a seating capacity of under 10,000. I’ll have a preview post for the Coastal Carolina game later in the week. I am not going to have a lot of time to do it, but I’ll figure something out. This week’s review is almost completely picture-free. After almost a decade of taking mostly bad pictures, my camera more or less died in the first quarter on Saturday. That may be a blessing. I’ll gladly trade the demise of an old, mediocre camera for a victory over the Gamecocks. I will include one shot I took with my cellphone, though. 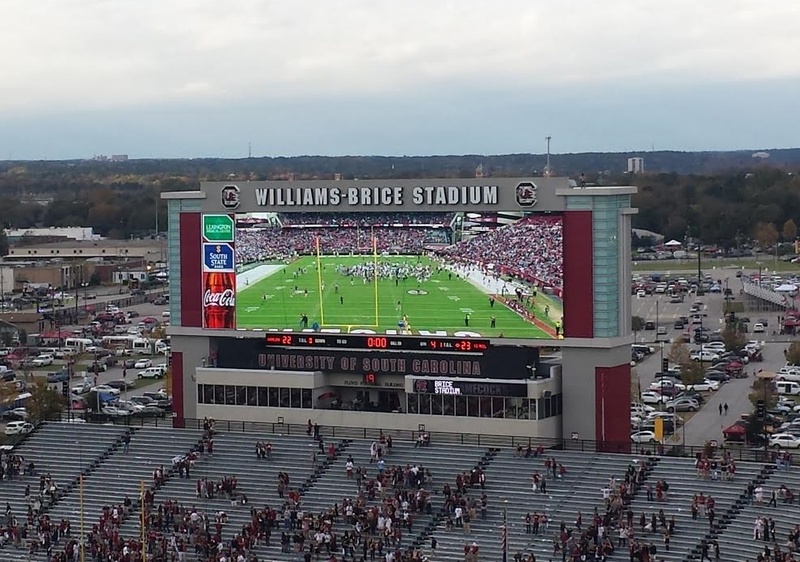 I was quick to snap it, and I had to be, as South Carolina rather amusingly “wiped” its scoreboard only a few seconds after the game was over. The game happened, though. Yes, it certainly did. The Citadel at South Carolina, to be played in Columbia, South Carolina, at Williams-Brice Stadium, with kickoff at 12:00 pm ET on Saturday, November 21. The game will be televised on the SEC Network [alternate feed], with play-by-play from Taylor Zarzour, analysis by Charles Arbuckle, and reporting from Paul Finebaum. The game can be heard on radio via the various affiliates of The Citadel Sports Network. WQNT-1450 AM [audio link], originating in Charleston, will be the flagship station. WQNT will have a two-hour pregame show prior to each home football game. Besides being televised on an alternate feed of SEC Network (611-1 on DirecTV, and available on most cable/satellite systems), the game between The Citadel and South Carolina will also be the site of the “SEC Nation” pregame show. The on-air crew will include Joe Tessitore, Marcus Spears, Tim Tebow, and Paul Finebaum. Essentially, then, he won’t be paying attention to the game on the field. I find that extremely disappointing, both from Finebaum and ESPN. The last time The Citadel played South Carolina, in 2011, I wrote about a great gridiron victory by the Bulldogs over the Gamecocks. I didn’t write about the 1990 game, though. Instead, I focused on the 1950 clash, which was played at Johnson Hagood Stadium and may have been an even bigger upset. First, the basics. Twenty-four teams will make the playoffs; ten will get automatic bids, fourteen will be at-large selections. Sixteen of those teams play in the first round. The eight teams that advance from that group play eight “seeded” teams in the second round (in other words, those seeded teams get byes; they also will be the automatic host teams for the second round unless something strange happens). From there, teams advance to the quarterfinals, semifinals, and finals. The title game will be played January 9, 2016, in Frisco, Texas. Three conferences do not get automatic bids. The Ivy League doesn’t participate in postseason football action, while the SWAC and MEAC champs will play in the new Celebration Bowl instead. However, one caveat: SWAC and MEAC teams can receive at-large bids. A team could finish 2nd in the MEAC, for example, and go to the FCS playoffs, while the champion of that league plays in the Celebration Bowl. This year, that could be an issue, at least in the MEAC. I’ll get to that later. The Northeast Conference title will be decided in a winner-take-all game between St. Francis (PA) and Duquesne. No other school in that league will get a bid. The other three leagues that haven’t had auto-bids decided yet will have multiple teams in the field. Four of these teams (Southern Utah, Montana, Northern Arizona, and Richmond) could grab auto-bids. The latter three have to win and hope other results go their way; Southern Utah just has to win its game to be the outright Big Sky champion. Now, I’m going to list the games Bulldog fans should be following on Saturday, including times (ET), lines, and TV/streaming options, with teams to pull for (if you root for The Citadel) mentioned in bold. The matchups are (very) roughly in order of importance, but don’t make too much of that. There aren’t any absolute must-wins (or losses) on the board as far as The Citadel is concerned, and you could also make an argument in two of these matchups that it would be better if the other team won the game. – A loss almost certainly knocks out every non-bolded team on this list, with the possible exception of Richmond. The Spiders would be 7-4 with a loss, against a respectable schedule, and also have a road win over James Madison. Richmond’s issue is that it would have finished the season on a three-game losing streak, and would be competing with New Hampshire and/or Towson to be the 3rd CAA team in the field (having lost to New Hampshire, and having not played Towson). – I believe the winner of Sam Houston State-Central Arkansas gets in, and the loser is left out. Part of me would root for Central Arkansas in this game, because UCA has a lopsided loss to Samford on its résumé, so The Citadel would compare favorably if that is taken into consideration. However, my fear is that both SHSU and Central Arkansas could get in if UCA wins this game, despite Sam Houston State only having 6 D1 wins in that scenario. The problem is that the Bobcats are a “name” in FCS, and are currently ranked 12th. I think it might be better for The Citadel if Sam Houston State won this game, essentially punching its ticket, and the Southland gets its standard two teams in the playoffs — rather than risking three Southland postseason entrants. – The loser of Eastern Kentucky-Eastern Illinois is out. The winner may get in, but it wouldn’t be a lock. The Citadel has a better case than either of them anyway, in my opinion. – North Dakota has a victory over an FBS team. Admittedly, that FBS team is Wyoming, which probably wouldn’t finish in the top 3 of the Big Sky this season, but any FBS win will look good to the selection committee. I could see UND making a late move up and grabbing a bid, especially if it can win on the road at Cal Poly. – Right now, I think The Citadel would be in with a couple of spots to spare. However, the Bulldogs could be “jumped” by a few teams. I am worried about the logjam in the Big Sky (a league that has historically fared well when bids are handed out) and the CAA (with a couple of last-gasp pushes by Towson and New Hampshire). – Bethune-Cookman is the wild card in all of this, and may be the team that concerns me the most. The Wildcats are playing 1-9 Florida A&M on Saturday, and a win would move B-C to 9-2 on the season, with 8 Division I victories. Bethune-Cookman is unlikely to get the MEAC’s bid to the Celebration Bowl even if North Carolina A&T loses this week, because of the tiebreaker setup in that conference. However, if B-C ties for the league title (or even if it finishes second), it would not be completely surprising to see B-C’s name on the bracket on Sunday. I don’t think it would be deserving, as the Wildcats’ schedule strength is not good at all, but I’m not on the committee. There is also the issue with the MEAC electing not to send its champion to the playoffs any longer, and instead having it represent the conference in a bowl game. Some members of the selection committee might consider that decision an abdication of participation by the MEAC in the FCS playoffs, regardless of its non-champion teams being eligible. Let’s assume The Citadel makes the playoffs. Where would the Bulldogs play? Could they host? Generally, the NCAA prefers to break things down regionally when it comes to placing teams in the FCS playoffs. It’s not unlike the college baseball tournament in that respect. The Citadel would not get a seed, even with a victory over South Carolina on Saturday. Possible first-round opponents include Coastal Carolina, William & Mary, James Madison, and Richmond. I don’t think the Bulldogs would play Charleston Southern in the first round (if CSU didn’t get a bye), but I could see the bracketing leading to a potential second-round matchup with the Buccaneers (in fact, that might be likely). Incidentally, Coastal Carolina’s hopes at getting a bye were all but dashed with its loss on Thursday night to Liberty. That could increase the possibility of a Coastal Carolina-The Citadel first-round game, with the winner playing Charleston Southern. Meanwhile, The Citadel has put in its bid to host a first-round game on Nov. 28, submitting a bid higher than the $30,000 minimum, according to a school source. And Citadel athletic director Jim Senter is working the phones. Also excellent: this effort by the Media Relations staff. Very well done. I think The Citadel has a very reasonable chance of getting an at-large bid. The numbers largely break in the Bulldogs’ favor. As long as there aren’t a lot of weird results on Saturday (or some political maneuvering in the committee room), The Citadel should be a part of the selection show (which airs on Sunday at 11:00 am ET on ESPNU). Of course, The Citadel could make all of this analysis moot by winning on Saturday. That would be fine with me. Normally, in this part of the preview I would compare the opposing team’s season statistics to those of The Citadel. However, since South Carolina is an FBS squad that plays in the SEC, that comparison struck me as largely irrelevant. I’ll just note a few things that caught my attention while going over South Carolina’s numbers. The Gamecocks’ advanced statistical profile looks very much like a team with a 3-7 record. – South Carolina does have some talented players on the defensive side of the ball. Linebacker Skai Moore (6’2″, 218 lbs.) leads the team in tackles (and tackles for loss). Moore is arguably the main reason North Carolina is not undefeated (well, maybe he shares that honor with Marquise Williams). – On his radio show, Mike Houston mentioned that 12 different Gamecocks would rotate along the defensive line, including Gerald Dixon Jr. (6’3″, 327 lbs. ), a massive nosetackle. Houston also noted the fine play of free safety Isaiah Johnson (6’0″, 209 lbs. ), who is second on the team in tackles. Johnson will probably be an important player for the Gamecocks when defending the triple option. – The defense has not been very good against the run, ranking 105th in rushing defense, allowing 5.04 yards per carry (110th nationally). The Gamecocks have been better at home in that category, however, allowing 3.86 yards per rush in Williams-Brice Stadium. – On 3rd down and between 7 and 9 yards to go, South Carolina ranks next-to-last in rushing yards allowed. Opponents have run the ball nine times against the Gamecocks in that situation, gaining 81 yards. Obviously, that’s not much of a sample size. – South Carolina has not been good at finishing drives, averaging 4.1 points per possession inside the opponents’ 40-yard line. That ranks 110th out of 127 FBS teams. – Starting quarterback Perry Orth (6’1″, 203 lbs.) has an older brother, Calvin, who played baseball at The Citadel from 2011-14. – Average size of the projected starting offensive line for the Gamecocks: 6’5″, 296 lbs. That projected group of starters includes 6’8″, 295 lb. Blake Camper, a freshman expected to start at right tackle in place of Mason Zandil, who suffered a high ankle sprain last week. Left tackle Brandon Shell (6’6″, 328 lbs.) is an NFL prospect. He has made 46 starts along the line during his college career. – I would imagine South Carolina’s offensive strategy in this game will be fairly simple. The Gamecocks will undoubtedly run Brandon Wilds (6’2″, 220 lbs.) and David Williams (6’1″, 222 lbs.) behind that huge offensive line, grinding out first downs and trying to control the clock. When not doing that, South Carolina will probably get the ball in the very talented Pharoh Cooper’s hands at every opportunity. At least, that’s what I would do. Cooper (5’11”, 207 lbs.) is really good. He has 51 catches for 700 yards this season, and is also averaging 6.1 yards per carry in limited rush opportunities. South Carolina has an excellent placekicker/punter combo in Elliott Fry (6’0″, 164 lbs.) and Sean Kelly (5’10”, 189 lbs.). Fry is 16-23 on field goal attempts this season, with a long of 52. He is a Type 1 diabetic who has managed to carve out a fine career at South Carolina. Kelly (who is also the holder for placekicks) is averaging 43.3 yards per punt. Of his 47 boots, 21 have landed inside the 20-yard line, against only 3 touchbacks. He has had 12 punts of 50+ yards this season. The Gamecocks have dangerous return men. Pharoh Cooper is the primary punt returner, while freshman Rashad Fenton (5’10”, 180 lbs.) ran a kickoff back 96 yards for a touchdown against LSU. The teams met every year from 1907 until 1937, and 11 more times from 1940 to 1954, but got together just twice in the ‘60s and three times in the ‘80s. This is the second matchup between the two schools since the turn of the century. The Gamecocks posted a 41-20 win on Nov. 19, 2011 in the last encounter. Let’s just gloss over the 1990s, shall we? – Those South Carolina game notes also mention this factoid: in nine games against FCS opponents since 2006, the Gamecocks are 9-0, with an average score of 38-13. – There are 40 players from South Carolina on the Gamecocks’ roster. Other states represented: Georgia (27), Florida (18), North Carolina (7), Alabama (5), Virginia (3), Maryland (2), California (2), and one each from Texas, Ohio, Pennsylvania, Missouri, Massachusetts, and Illinois. – Per one source that deals in such matters, South Carolina is a 20-point favorite over The Citadel. The over/under is 57. Other lines involving SoCon teams: Furman is an 8-point underdog at Wofford; Western Carolina is a 14-point favorite at VMI; Samford is a 3-point favorite at Mercer; and Chattanooga is a 30.5-point underdog at Florida State. East Tennessee State is a 1.5-point home underdog against Kentucky Wesleyan on Saturday. – Per the S&P+ ratings, South Carolina has a win probability of 93.1% on Saturday. Only five teams have a higher win probability this week: Middle Tennessee State (over North Texas), West Virginia (over Kansas), Florida State (over Chattanooga), Clemson (over Wake Forest), and Alabama (which has a 99.9% win probability over Charleston Southern). – Among FCS teams, The Citadel is 19th in this week’s Massey Ratings. The ratings for other league teams: Chattanooga, 13th; Western Carolina, 23rd; Samford, 45th; Wofford, 49th; Furman, 54th; Mercer, 55th; VMI, 81st. North Dakota State now sits atop the Massey FCS Ratings, followed by Illinois State, Jacksonville State, South Dakota State, and Dartmouth. East Tennessee State is 123rd, just ahead of Mississippi Valley State and Arkansas-Pine Bluff. – The weather forecast for Saturday in Columbia, according to the National Weather Service: sunny, with a high around 58 degrees, a northeast wind around 7 mph, and a 20% chance of rain after 1 pm. – Saturday is Military Appreciation Day at Williams-Brice Stadium. – South Carolina is beefing up security for the game. Keep that in mind while deciding when to leave the tailgating areas and enter the stadium. – The Citadel will wear white jerseys and hideous gray pants on Saturday. The Citadel could win on Saturday. It wouldn’t blow anybody’s mind, at least not anybody who was paying attention. That said, South Carolina, even with its struggles this season, is still an SEC team. It has huge resource advantages, and a lot of talented players. In addition, the “look ahead” factor for this game is probably slight, despite Clemson coming to town next week. South Carolina wants to win a game — any game. It isn’t like the Gamecocks have 6 to 8 wins already and are cruising to a bowl game. I think The Citadel will move the ball (at least occasionally) against South Carolina’s defense. I am concerned about the Bulldogs’ D, though. Regardless, I’m looking forward to this one. For one thing, it’s a home game for me. It is also a great opportunity for the team. Don’t be afraid to make a little history, guys.